Do some things in life bring you right back to your childhood? Ramen Noodles does it for me. For some reason it was the BIGGEST treat ever when we got to have them. I know, I know, my Mom was silently rejoicing that we thought this right? Cheap, easy and every Mom’s dream I’m thinking! Now in my “old age” I still love to make them and dress them up in a main dish for my family. Apparently you must think the same thing because this Pork & Ramen Stir-Fry has been hot ever since I post it a few years ago. I aim to please so today I decided that you need another dish like this! I love that this dinner recipe has the veggies right in the main dish so I only have to make one dish and I’m D-O-N-E! Life is good! Unfortunately, my husband does not agree with me. I swear he’s like a adult male in a twelve year old’s body. He hates veggies. I have about three of them I can make and he’ll eat. Other than that he wrinkles his nose and picks them out. I’m the opposite. I’m grabbing all the veggies he picks out and adding them to my plate. Miss K is the same way with veggies as me. She literally went to the grocery store and picked out fresh green beans to steam for her bedtime snack? I about fell over. I was like, who’s kid is this? I quickly agreed and whipped them up that night for her. She kept telling me about how healthy and yummy they were and that they would make her grow big and strong. I kept nodding like an idiot and smiling. I hope this love of green beans lasts! 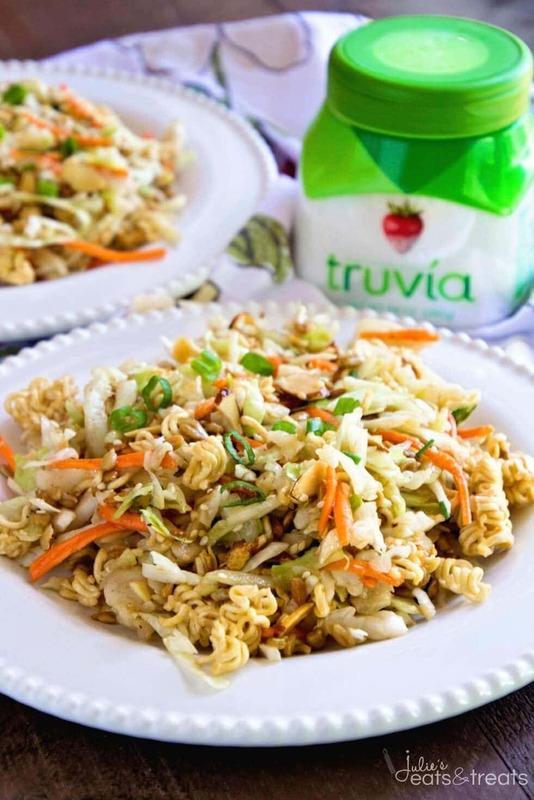 To make this Chicken Ramen Stir-Fry a little bit lighter I used Truvía® Brown Sugar Blend. It’s one of my favorite secret ingredients because it helps me reduce the calories in delicious recipes and not sacrifice the flavor. Truvia® sweetener is natural, great-tasting sweetness that was born from the leaves of the stevia plant. 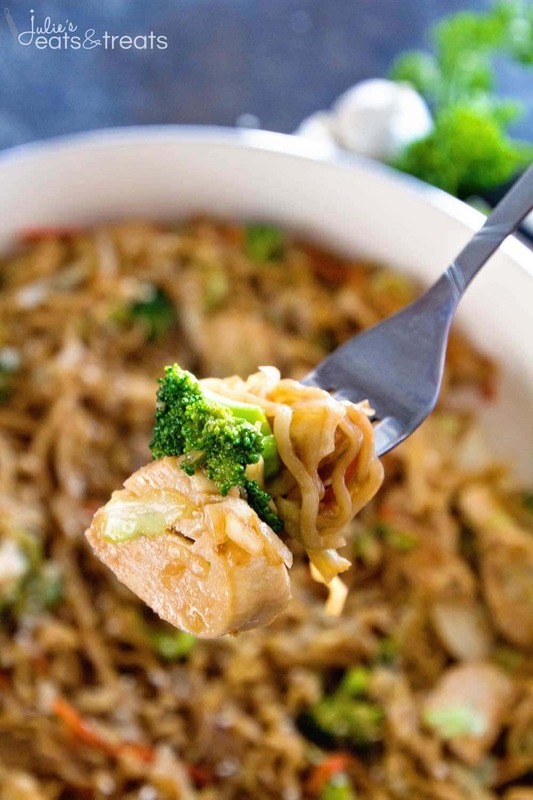 This Chicken Ramen Stir-Fry is becoming one of our favorite meals and I think it will become a favorite in your house too! 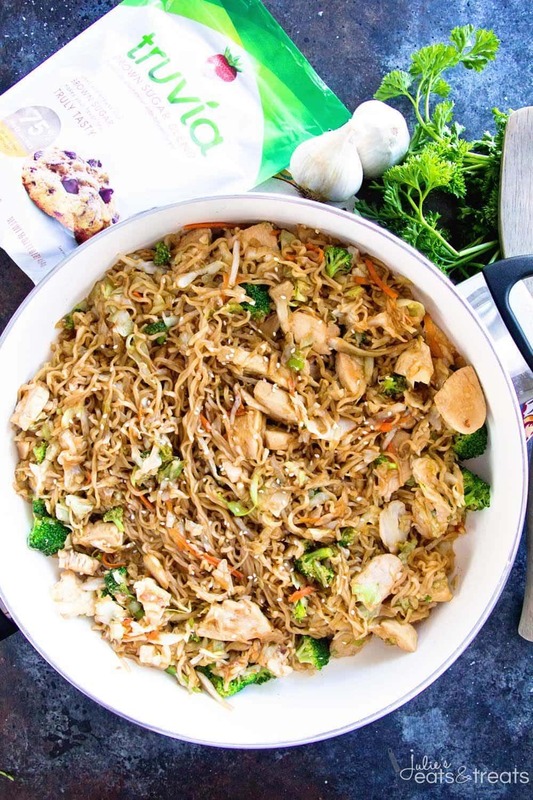 Easy, Delicious Weeknight Meal Loaded with Healthy Ingredients with the Addition of Ramen for a Fun Twist! On the Table in 30 Minutes! Bring medium size pan of water to boil. Add Ramen noodles and cook them according to package directions. Drain and stir in 1 Tbsp of vegetable oil. Set aside. In a large skillet heat 2 Tbsp vegetable oil over high heat. Add chicken and cook until chicken is cooked through and no longer pink, about 5-7 minutes. Remove from skillet and set aside. Add broccoli, coleslaw mix, and garlic and saute for 3-5 minutes. Add ginger and fry for another two minutes. Meanwhile in a mixing bowl combine chicken broth, soy sauce, cornstarch, sesame oil, and Truvía® Brown Sugar Blend and mix until blended. Add chicken, Ramen noodles, broth mixture into skillet and cook until heated through. Grab More Delicious Ramen Dishes! 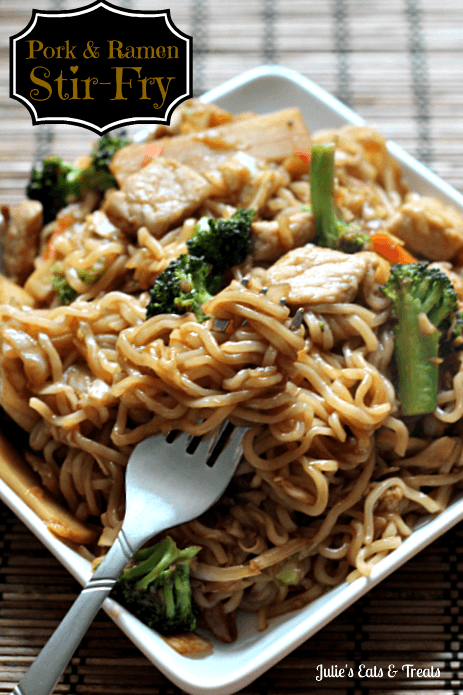 Pork & Ramen Stir-Fry ~ Ramen Noodles add a fun twist on normal Stir-Fry! Asian Ramen Salad ~ Quick, Easy and Full of Flavor! It’s the Perfect Potluck Salad and Only takes Minutes to Throw Together! Sweet, Savory and Delicious with the Perfect Amount of Crunch! Julie, My husband and I love Ramen Noodles and that chicken one looks very good? I was just wondering if i had to use Truvia brown sugar or could i use another kind of brown sugar? Would i have to buy a ginger root, because i have never used it before? Please Reply back ASAP! Thanks! You can also sub ginger powder like 1/4 tsp. This is my kind of dinner! I need to make this ASAP! Julie this recipe is exactly what I’ve been looking for. 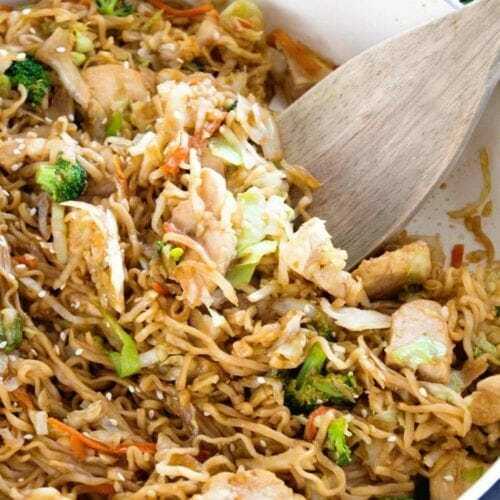 Asian inspired, easy and fast. I do have a question though. I can’t find just ramen noodles at my local store. Could I use the package soup noodles and just discard the flavor packets? Thanks so much for sharing all these great recipes with us. Yup just buy a package with seasoning and toss the seasoning! Julie, This looks yummy. What do you do with the flavor packet in the ramen? This looks delicious, I can’t wait to try it. And I know my husband will love this version of ramen! I love that your daughter loves her green beans! We’ve got a green bean lover over here too. When my oldest was about 3, he asked if he could put green beans on his ice cream. I said why not, and he thought it was the greatest thing ever. He’s 7 now and still loves his green beans! I don’t want to sound negative, but, has anyone actually tried the recipe? Thanks for the incredible recipe. I have made this several times now and it’s become a regular in our rotation. We love our veggies, so the only modification I’ve made is to add more veggies. In addition to the coleslaw mix, I use 2 small heads of broccoli and a package of either fresh snow peas or sugar snap peas. The sauce brings the whole thing together. Absolutely delicious… house of full & happy bellies here! Great additions! This is one of our favorites too! Does this recipe save well for leftovers? I like to meal prep and make batches that will last 2-3 days. 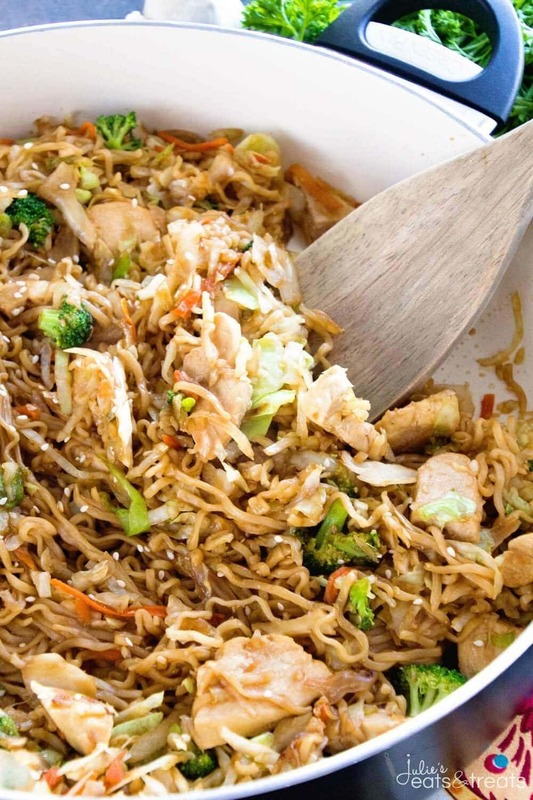 The only thing that might happen is that the noodles will soak up the sauce a bit!